113. Celeste SOILEAU was born in 1774 in Louisiana, USA. Her parentage can be confirmed via the baptismal record of her several of her children.251 She died before 18 November 1834 because her estate in succession by this date. iii. Celestin BORDELON was born on 15 April 1796 in (Avoyelles Parish), Louisiana, USA.939 He was baptized on 20 November 1796 at Saint Paul the Apostle Catholic Church in Mansura (Avoyelles Parish), Louisiana, USA.939 War of 1812 Military service: (War of 1812, Private, 17th, 18th & 19th Consolidated Regiment, Louisiana Militia) in 1812.940 He was buried on 11 February 1843 in Mansura (Avoyelles Parish), Louisiana, USA.941 Notice of Celestin's succession appeared in a 1843 edition (exact date unknown) of "The Expositeur". The name of his wife appears in the legal notice. iv. Pierre BORDELON was born on 31 October 1800 in (Avoyelles Parish), Louisiana, USA.942 He was baptized on 26 February 1801 at Saint Paul the Apostle Catholic Church in Mansura (Avoyelles Parish), Louisiana, USA.942 He died before 8 May 1830 - the date his wife married for a 2nd time. 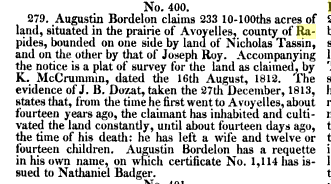 There is a burial recorded at St. Paul's in Mansura dated 20 September 1825 for a Pierre Bordelon who died at the home of Francois Bordelon but I'm unable to confirm if this burial belongs to him. vi. Louis (Don Louis) BORDELON was born about March 1805 in (Avoyelles Parish), Louisiana, USA.945 He was baptized on 3 September 1806 at Saint Paul the Apostle Catholic Church in Mansura (Avoyelles Parish), Louisiana, USA.945 There is a burial recorded at St. Paul's, Mansura, "Don Louis Bordelon" on 25 June 1868 at the age of 68 years but I'm unable to confirm if this is his burial. vii. Zenon A. BORDELON was born in December 1806 in (Avoyelles Parish), Louisiana, USA.946 He was baptized on 24 November 1807 at Saint Paul the Apostle Catholic Church in Mansura (Avoyelles Parish), Louisiana, USA.946 He was deceased by 6 December 1866 - the date of a family meeting associated with his wife's succession. viii. Victorin BORDELON I was born about January 1808 in (Avoyelles Parish), Louisiana, USA.947 He was baptized on 20 November 1808 at Saint Paul the Apostle Catholic Church in Mansura (Avoyelles Parish), Louisiana, USA.948 In the book entitled "St. Paul the Apostle Catholic Church, Mansura, Louisiana, Avoyelles Parish, Register of Burials, 1824-1850", there is a burial dated 31 March 1850 for a "Victoria Bordelon". Based on a succession record dated 15 April 1850 (Inventory Book B) for a "Victorin Bordelon", it is believed that the 31 March 1850 burial record is, likely, for Victorin. However, there is no identifying information in the succession record to positively confirm that the record is for this Victorin. To support this belief is the fact that all of his children are scattered and living in the homes of others in the 1850 census. This would be expected since Victorin's wife, Pelagé (Pélagie) (Melagie)(Melice) Mayeux, was buried on 7 February 1849 and their children were, therefore, orphans.